Boss chests in dungeons will have a legendary item inside them. Now with RNG technology! Users Old Nick and fireundubh for their gracious help getting the scripts in working order. Thanks to good samaritan fireundubh, we now have RNG support. Check the description for how it works. Somehow the .esp file I uploaded yesterday was the wrong version; it now points to the correct script. User fireundubh has suggested a way to add a chance to generate legendaries instead of it being guaranteed. The changes will be up soon. Fixed the script; now it only generates a legendary when the container is first loaded and when it resets instead of every time it loads. Big props to user Old Nick who noticed long before I ever would have. Hot damn, we made Hot Files! Thanks to everyone who downloaded and put up with a bunch of seriously broken versions. Extra special thanks to those who contributed in fixing those seriously broken versions. Funny thing is that I thought that if any of my mods would ever make Hot Files, it'd be Rechambering Plus, which I put a lot more work into and which I think is much better overall. If you feel like stroking my ego and/or validating my existence, give that one a look-see. Lack of decent legendaries got you blue? Miss the days of when your reward for completing a dungeon wasn't just a fistful of bullets and a mediocre weapon? I've got the fix right here! Does what it says on the tin: the boss chests (usually called "Steamer Trunk" or sometimes just "Trunk") found at the end of most indoor and outdoor "dungeons" will now have a random legendary item inside. The item is generated using a vanilla script called QALegendaryContainerScript which is normally used to generate the cheat/debug "Legendary Items" container (normally it defaults to 100 but this mod only generates one). The container script itself calls on the script used to generate legendaries dropped by normal legendary enemies; I believe this means that the items generated by this mod will be scaled to the player's level, but frankly I'm not exactly sure. Thanks to the eagle eyes of user Old Nick (you should check out his mods; they're probably way less broken) version 1.1 is live! Previously the script would fire every single time the container was loaded, i.e. generating a legendary pretty much every time you look at a boss chest. It will now only do so once when the container is first loaded and then again only if its cell has reset. As a result of the careful tutelage of user fireundubh, this mod now has RNG technology! Version 2.0 forward calls on a shiny new script and a shinier newer global variable, allowing for a chance instead of a guarantee to generate a legendary, and it does it all with only one .esp file! The chance is determined by a global variable called 'BossChestLegendaryChance' which defaults to 1, i.e. 100% chance to get a legendary. To modify it, simply crack open your console (on U.S. keyboards it's `/~, above the tab key) and type set BossChestLegendaryChance to X where X is whatever value between 0 and 1 that you want it to be, i.e. a 25% chance would be 0.25. This mod only alters the records for the boss chest containers themselves; mods that alter the same records will have conflicts. Simple Intersection and other mods like it alter every vanilla container record in the game, including those that aren't ordinarily buildable at workshops, presumably to hedge against the possibility of the player using a settlement expansion mod (like Homemaker) that makes those containers craftable. The conflict is mostly unnoticeable, and can be mitigated by loading this mod after Simple Intersection or the like. When in doubt, prevent this mod from being overwritten by keeping it near the end of your load order. This mod doesn't touch the records for leveled lists, legendary effects, or the script for generating legendary items. As stated above, version 1.1 includes a replacement version of the QALegendaryContainerScript. This isn't the script that generates legendaries, it just calls that script. Other mods that replace the QALegendaryContainerScript (if such a mod exists) will break this mod. Version 2.0 does away with the replacement script entirely. No compatibility issues should arise from it. I haven't done much testing beyond making sure the mod works and doesn't crash. That doesn't preclude some massive issue that I have yet to uncover. As with all mods use at your own risk. Some dungeons don't have a boss chest as this mod recognizes it. These won't have legendary items. Sorry. Likewise, there are a few boss chests that don't really have a dungeon. The Concord Speakeasy, for instance, has a Steamer Trunk behind a locked door but zero enemies. These are basically free legendaries. This mod will probably make your game easier since you'll get more legendaries with no drawbacks. In my mind, something like 90% of legendaries are total garbage anyway, so I don't think it's a huge deal. Originally I wanted to have a repeatable radiant quest to generate legendary weapons, like the Treasure Hunt quests you get from the notes you find on dead Gunners and Settlers, but that's something that will probably have to wait until the Creation Kit. 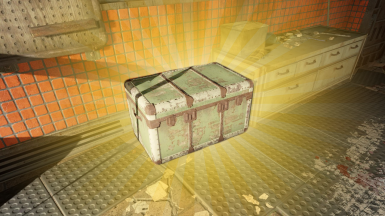 Obviously this mod doesn't include the Steamer Trunks you can build at workshop settlements since that would be ridiculous (although it wouldn't be a bad idea for another mod; spend a bunch of resources for a random legendary). This mod includes an .esp file and a .pex script file. All you should have to do is extract the .zip into your data folder or install via NMM. Uninstalling should be totally painless. Boss chests that have already been loaded by the game will still have a legendary inside, but no more will be generated going forward. This mod was made using FO4Edit, Bethesda Archive Extractor, PexInspector, Champollion, and Caprica. Show them some love if you know what's good for ya. If you'd prefer to get your legendaries the old-fashioned way (i.e. extricating them from the dismembered corpses of your slain foes) but still want to get more of them, check out Custom Legendary Enemy Spawning by Iron Rose, which I personally use alongside this mod.